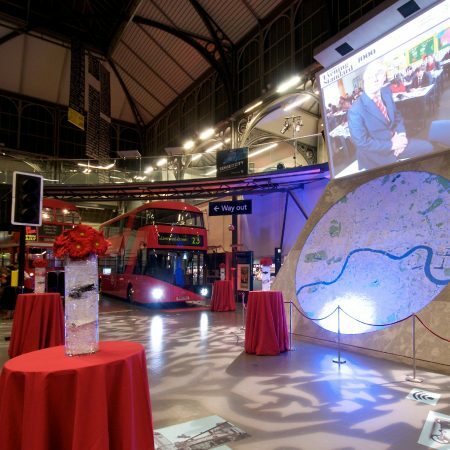 This Christmas we are excited to be working across the capital in a range of exciting venues. Our Christmas parties come in all shapes and sizes from standing receptions to seated dinners. Sometimes we organise daytime conferences which then move into a party. Equally lunches are also popular. December seems to be a party season all round and we definitely get involved in that buzz. 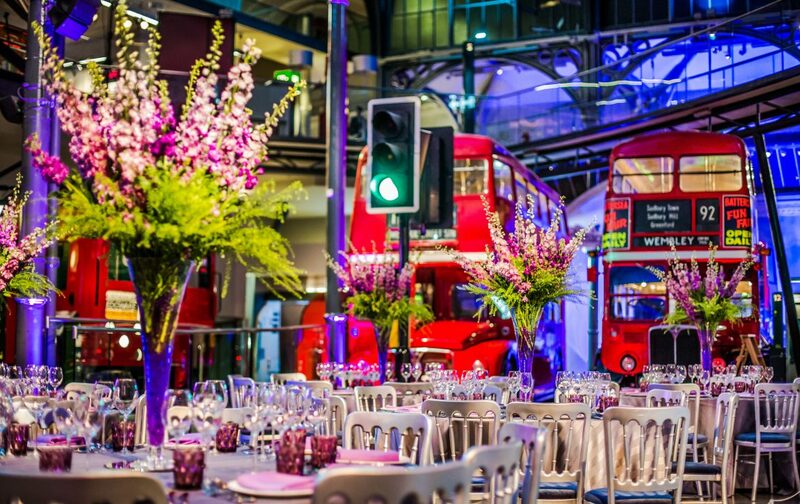 The London Transport Museum is deservedly our favourite quirky venue of the month. 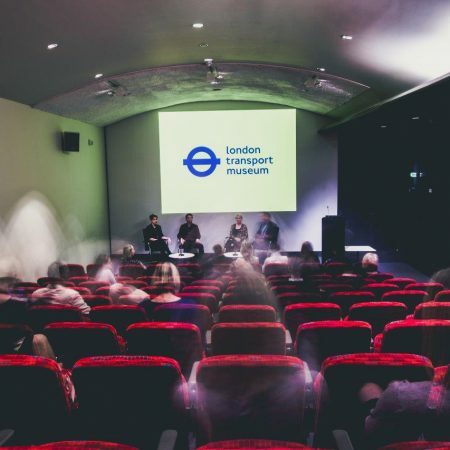 This magnificent museum is based in the heart of the busy Covent Garden. It is nestled just on the corner of the Piazza and certainly ticks the box of being centrally located – you can’t beat the convenience. The Grade II listed building is beautiful – the glass roof and cast iron pillars of the original Victoria Flower Market add to the impressive feel. The museum feels bright and airy with its high ceilings and large event spaces. In 2017 the museum underwent a £½million refurbishment and upgrade. We really like the flexibility of the space. Throughout the year we use the impressive theatre on site that so many people don’t even know about. It seats 120 and benefits from incredible AV – the sound is fantastic and the screen is huge! The adjoining foyer space means that it’s great for screenings and is a hidden gem. Even though it is so centrally located most people haven’t visited the museum before. We find this really helps with attendance rates as it’s somewhere a bit different and it feels special. 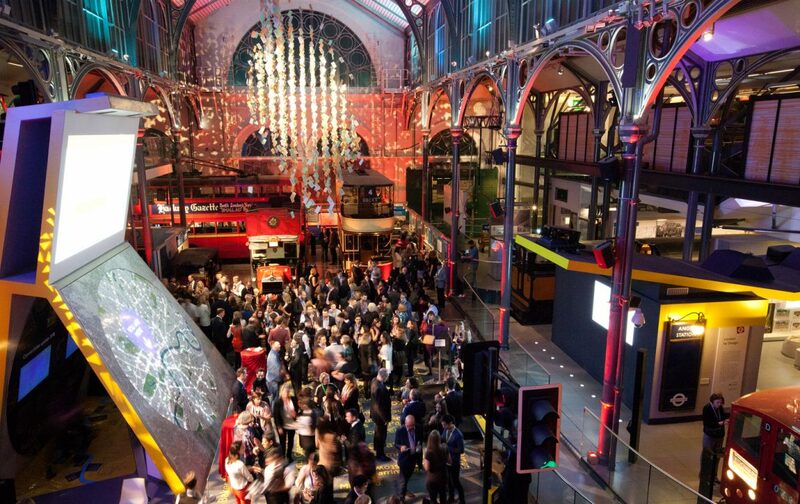 It is always going to sound very cool to say that you’ve hire a whole museum exclusively for your Christmas party! For any Londoner or anyone who has visited the capital it’s clear that transport is key to the functionality of the city. 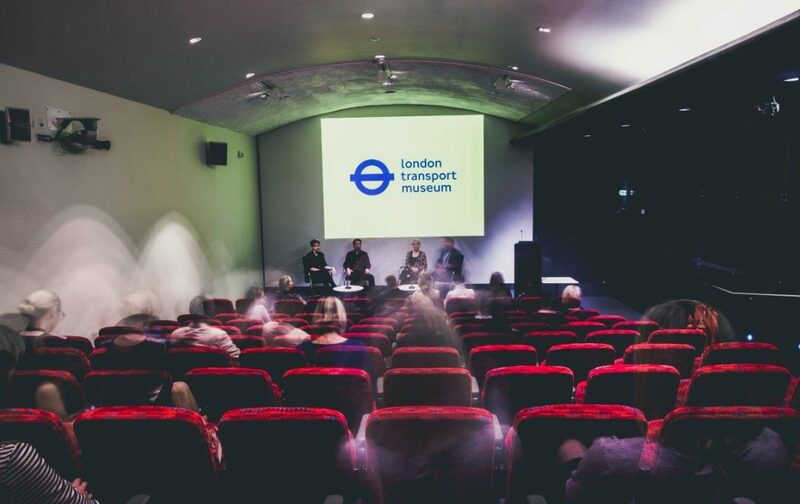 The museum celebrates this, making the event space not only a great place for a party, but also a brilliant space to explore. 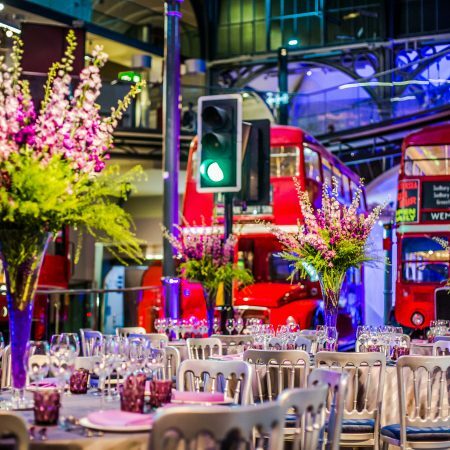 The modern galleries work equally as well for receptions as they do dinners. 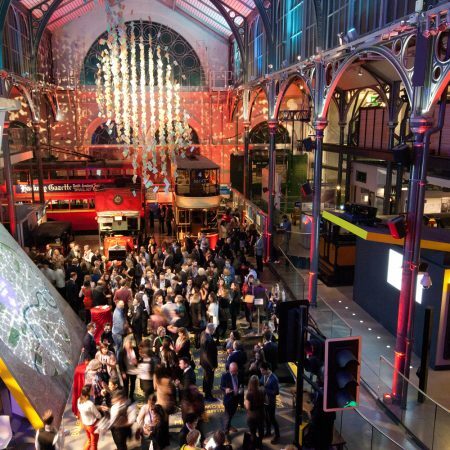 We find that clients who want to offer something extra at their events love the option to add a private view of the exhibition or even just for guests to explore the galleries. On arrival, guests make their way through the start of the galleries and up around into the main space. The main space is breath-taking and not what you’d expect. 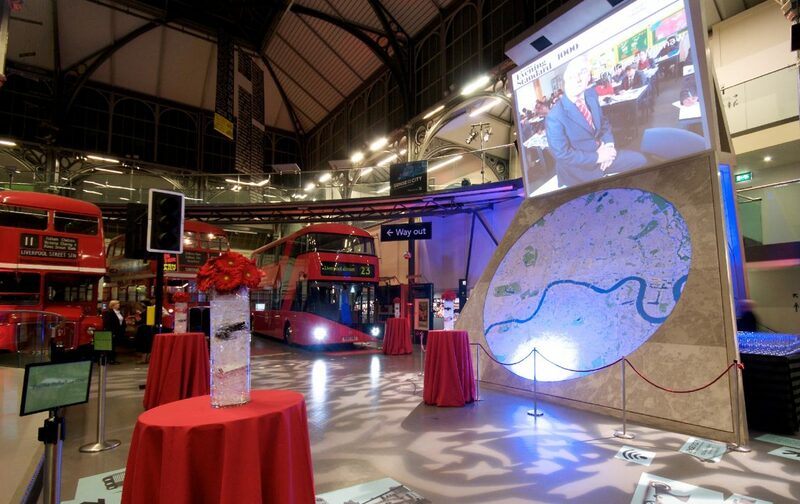 The high ceilings give a sense of grandeur and it definitely gives the wow factor to have real buses inside! The buses are such a great photo opportunity. Around the open space are smaller galleries which guests can explore and discover. It’s great for fun parties but also events where perhaps people don’t know each other – there are so many options for conversation starters. The food at the venue is provided by our sister company Clerkenwell Green (Link to their site) and they often have great fun with the transport link. The tube symbol works well as an ice cube for cocktails and always makes guests smile! Also how about ‘Double Decker red’ for your cocktail colours? It’s really quirky to have those little touches and they create brilliant Instagram moments. The space can hold 180 for a seated dinner and 500 for a standing reception. Even though it looks big it feels very intimate for the events and the buzz when the guests fill the space is brilliant. Speeches work well from one of the buses! We have been suggesting the venue so often for Christmas as it’s just a great, unusual and quirky option. We find that many companies want something unique and different when it comes to the Christmas celebrations. We feel that this venue ticks the boxes on so many levels. Great food, unique, brilliant location, impressive spaces and a bit different. We’ll never get over the buzz of walking into a museum once it’s empty of the public and having a glass of champagne within the exhibits. It feels very special and we know it’s not just us that loves this feeling! Get in touch to discuss our Christmas packages here or how to use the venue throughout the year. To see more about the venue, view the full profile here.